Below is a visualization and description of some of the most significant incidents of political violence in Nigeria from February 20, to February 26, 2016. This update also represents violence related to Boko Haram in Cameroon, Chad, and Niger. These incidents will be included in the Nigeria Security Tracker. February 22-25: Over the course of four days, sectarian violence led to the deaths of three hundred in Agatu, Benue. February 22: Unknown gunmen killed seven in Birnin Kebbi, Kebbi. February 23: Nigerian soldiers clashed with followers of ex-militant leader Solomon Ndigbara in Gokana, Rivers. Two soldiers, two militants, and one civilian died. February 23: Pirates attacked a vessel off the coast of Brass, Bayelsa, kidnapping two sailors. February 23: Six were killed in a gang war in Ibadan, Oyo. February 24: Nigerian troops repelled a Boko Haram attack on Dikwa, Borno, killing twenty-six militants and losing one soldier and one member of the civilian Joint Task Force (JTF). 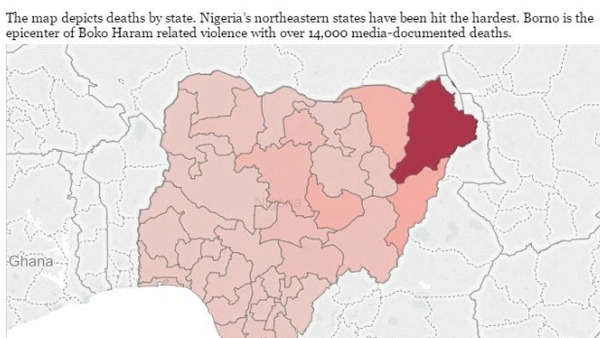 February 26: Sectarian violence led to the deaths of four in Ibi, Taraba. February 26: Cameroonian and Nigerian soldiers killed ninety-two Boko Haram insurgents in Bama, Borno. Two Cameroonian soldiers were also killed.